In a magical silver sphere made of blossoms hides a tiny, enchanted, golden bird. 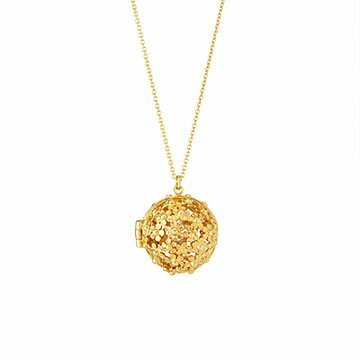 Formed of tiny sterling silver filigree blossoms, this enchanting sphere locket opens to reveal a little, golden bird. Lovely on a literal level (who doesn't love flowers and birds? ), its deeper beauty lies in the metaphorical meaning the wearer attaches to her secret winged companion: hope and optimism, perhaps, or maybe freedom, happiness, or hidden strength. What's not hidden is London jewelry designer Alex Monroe's gift for making feminine, delicate, uniquely charming, handcrafted jewelry. Made in England.